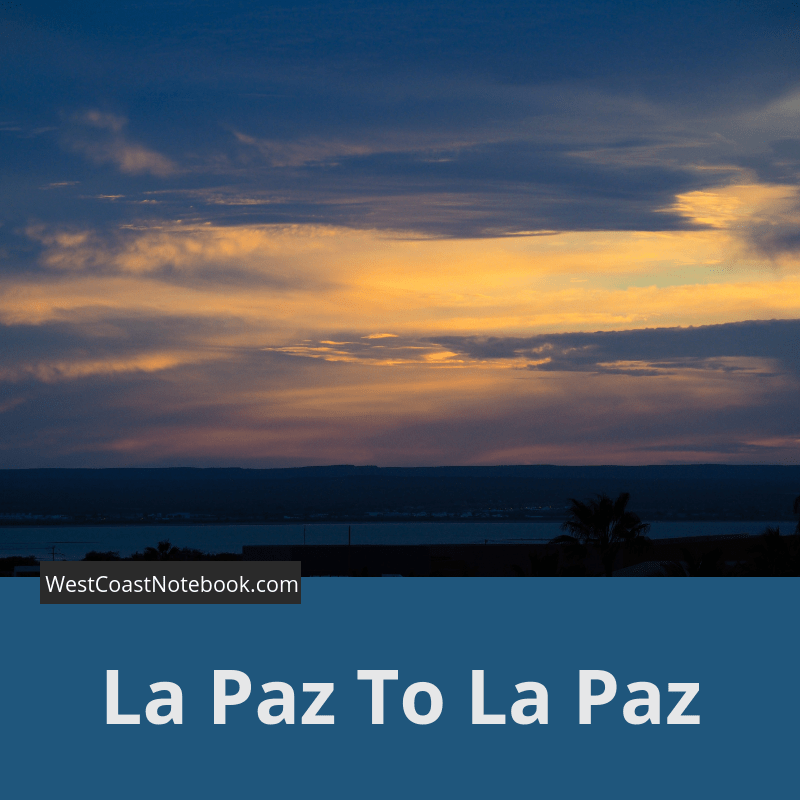 Well, it wasn’t quite La Paz to La Paz but it seemed like it. La Paz was actually yesterday, but we are here again today. Starting out in Ciudad Constitucion early as the bed was hard and the room had a very perfumey smell but it was a place to hang our head for the night. Rob went in search for coffee and finally ended up buying a cup from a lady off the street who was just setting up her booth before we heading down to Puerto San Carlos. First… one needs to get out of town. They have these signs called ALTO (mean STOP). And there could be a 4, 3 or 2 way stops. But, no one stops. Sometimes they don’t even slow down. It’s like playing Russian roulette as you come to an opening in the road where another street intersects. Rob soon got the hang of it though and was barely slowing down with the best of them. The car had gotten really dirty from salt spray and it was hard to see out the windows, so Rob just pulls into a gas station, finds a hose that is watering some plants and proceeds to grab it and wash the car. You should have seen the face on the man who can out of the store. He just couldn’t believe that someone was doing that and came over to find out what the heck was going on. Meantime the guy at the pump came over to see as well and Rob offered them both a tips and smiles abounded. Soon the gas station attendant went and got his squeegee and proceeded to clean all the windows and we headed out of town with coffee and a clean car. 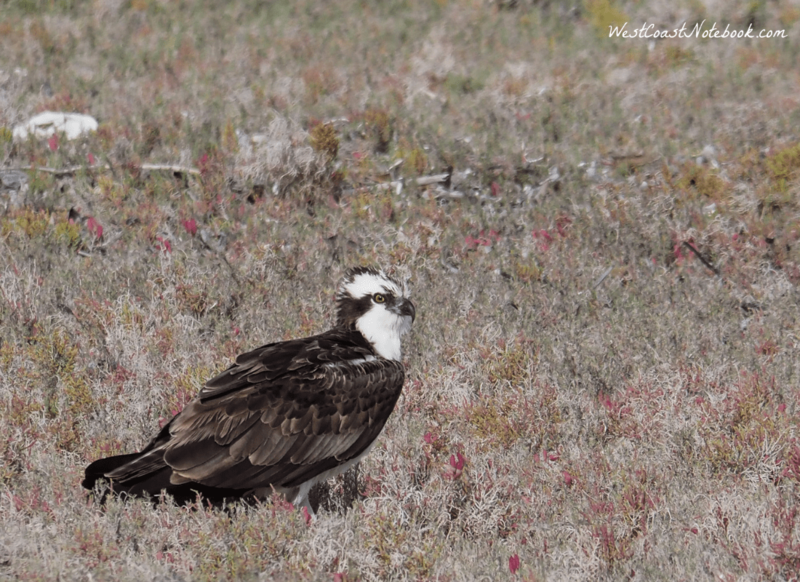 It was 45-minute drive out to Puerto San Carlos and there were lots of birds to see along the way. Morning really is the best time to be birding. Lots of caracara’s, loggerhead shrikes and little birds that I didn’t get a look at. Saw numerous hawks as well. From the desert, we came into farmland and then back into the desert again and started seeing what looked like birds nests in the tops of the power line towers. 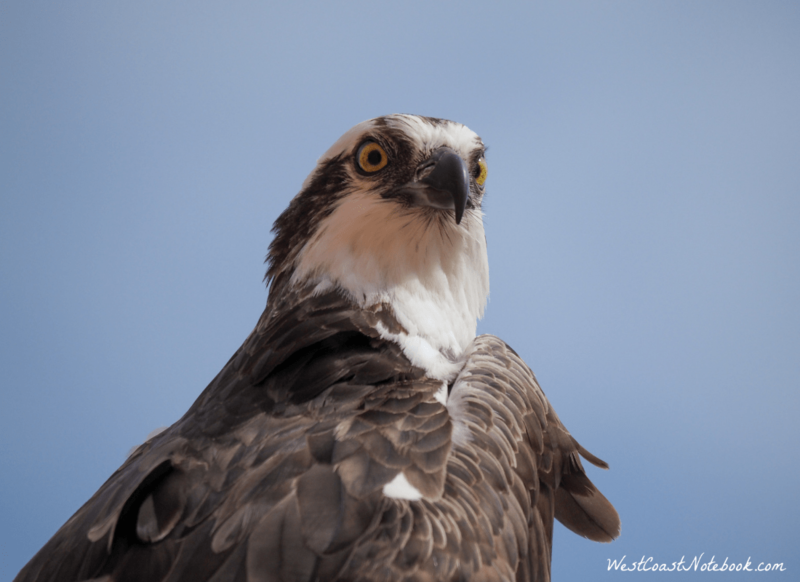 Then we could see platforms built on poles with nests on them until finally we saw something in the nest and it was an osprey. 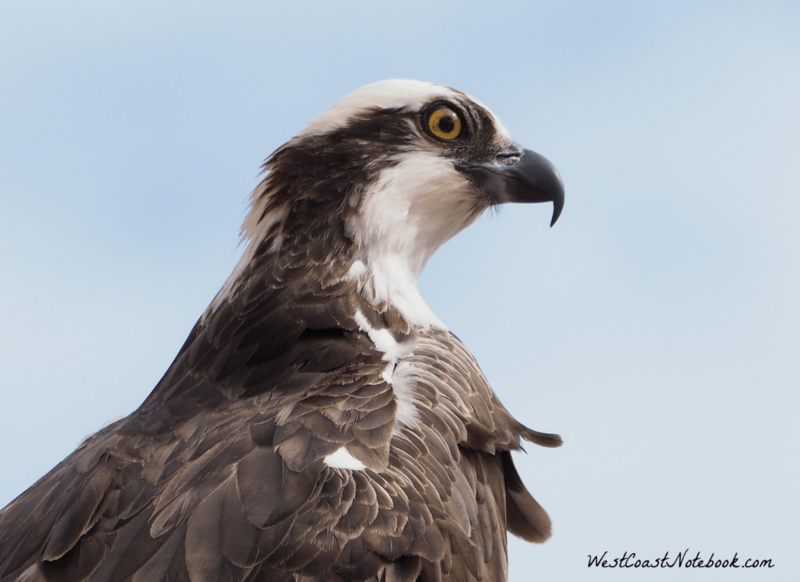 There was osprey nest everywhere so we knew we weren’t that far from the coast as they are predominately fish eaters. From the desert, we started seeing mangrove stands and everything turned green. Water was alongside the road and I could see egrets and herons hanging out in the trees. 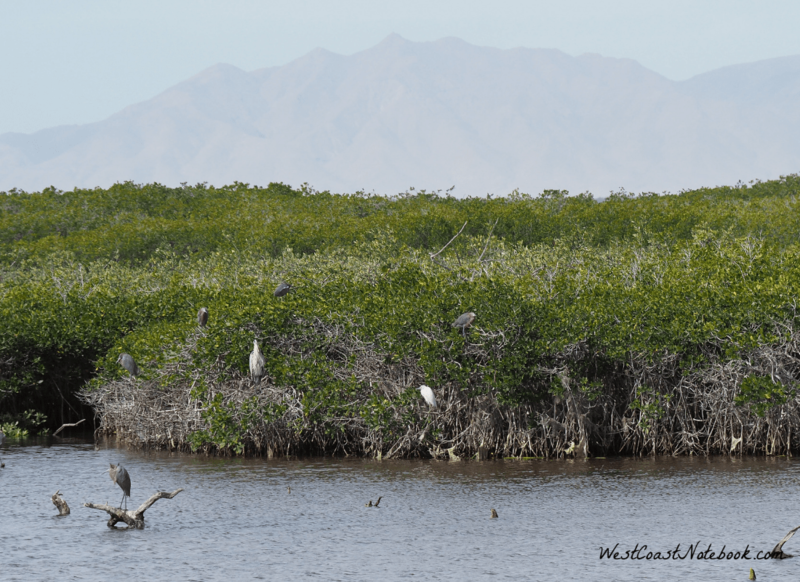 How many egrets and herons can you see? Finally getting into town the wind was blowing so hard I could hardly get my car door open. What would have been a lovely spot on a calm windless day was cool and the water was throwing up a chop. Essentially it was a fishing village and was really the first place that we had seen local people actually going about their day to day lives. This wasn’t a tourist town although there was a couple of hotels and everyone was friendly. Definitely not a day for a walk on the beach or a whale watching trip. Finding a place for breakfast we ate it with the house sparrows who were inside the restaurant and headed back from whence we had come and ended up in La Paz. We found a place that is on the outskirts of town but on the water. The first place we went into was nice but then proceeded to do the whole gauntlet of waterside street hotels to see if we could find something better but alas. We came back to the first one and I’m glad we did. The hotel is called La Posada and is lovely. Turns out the only room they had left was one they call The Master Suite but of course was one of the most expensive. After much going back and forth they finally gave it to us for the price of the Junior Suite and at the local rate. Came to about $110 USD. Two floors, outdoor terrace, king size bed, large spaces, jacuzzi with sea view. Slippers, shower, hairdryer, bathroom accessories, sitting area, telephone, desk, sofa, air conditioning, HD LED Cable TV, washing and ironing service, WIFI in the room, coffee maker, Jacuzzi, minibar in the room, tea / coffee making facilities, chairs, beach towels, safe, balcony. If you click on this link and then click on the arrows on either side of the picture you will get a good idea of where we are. If you see the desk, I’m sitting there typing. To go up to the next floor there is a spiral staircase and it’s a whole nother room up there. I feel like a princess in a tower. We are right at the end of the hotel so we got to watch the sunset tonight before we went down for dinner. Did I mention the downside? The downside being that we are on the fourth floor and the elevator is broken. Nothing like a good way to wear off dinner! Clouds were rolling in tonight and it is supposed to be cooler here for the next few days. Cooler means 66 degrees and that’s for most areas except around Cabo which will be in the early ’70s. There is talk of us staying here for another day and that would be nice as there are lots of birds on the beach. It’s actually the first beaches that I’ve seen here that have food on them for birds to eat. Lots of clams and different kind of shells of mollusks and even seaweed. All the other beaches we’ve been on are just sand. It feels nice and restful here after 2 days of driving and the bed is starting to look inviting.